Tiny houses or— as Jeremy Weaver suggests they may be called—small houses, micro houses, nano houses have captured the attention of many as people dream of downsizing, shedding the clutter in their lives, or a foot-loose lifestyle that might be found with a portable home. Prices for tiny homes range from about $25,000 to over $100,000, depending on size and materials. 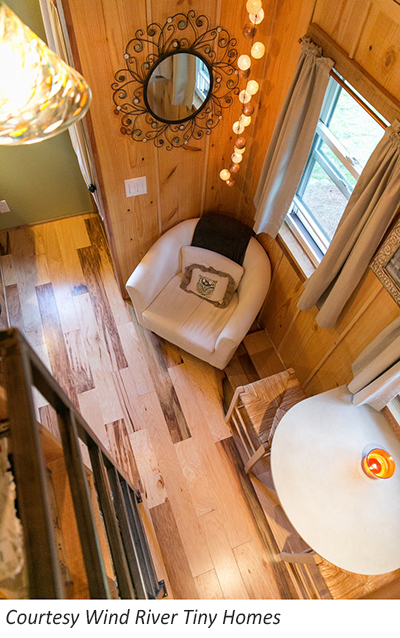 Creative use of space is the name of the tiny house game, and owners of the companies that build these little gems pride themselves on their originality and their ability to custom build just about anything a customer desires. 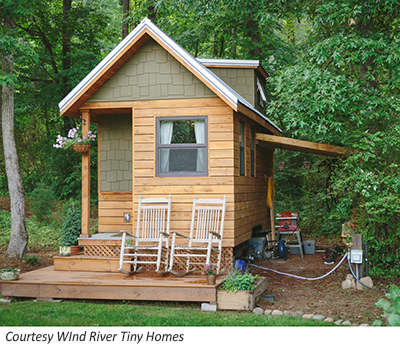 Most tiny houses feature lofts, composting toilets, tankless waterheaters, and innovative storage of all types. In concept, tiny houses have been around a long time—they might be a cottage, an ice-fishing shack, a houseboat, or anything else that can be imagined. Generally speaking, a tiny house is no more than 400 square feet. That’s the equivalent of a room that’s 20×20—and that’s large for a tiny house. Through the years there have been projects showing small pre-fabricated homes and living space made of local materials (remember straw bale homes?). But it wasn’t until the real estate crisis that tiny houses (helped along by television shows touting their many spendors) became a popular concept. One thing tiny house building companies all share is their willingness­—and eagerness—to custom build the small house of a person’s dreams. Those who are involved in the building of tiny houses may be a breed apart. Randy Jones founded Incredible Tiny Homes in Morristown, Tennessee in 2014 with a passion to pursue professional standard of craftsmanship in the Tiny Home industry. “Incredible Tiny Homes represents a dream to provide affordable and comfortable housing for everyone,” Jones says. David Thompson explains that tiny houses is a natural outgrowth of EZ Portable Buildings’ long history of building storage buildings, garden sheds, and lofted barn cabins. Choices range from The Haven, an open layout with a bathroom in a space 8-ft.x20-ft., to The Austin two bedroom, a 14-ft.x32-ft. plan. 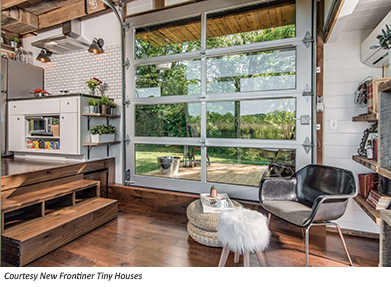 New Frontier’s Alpha tiny house comes completely equipped on a 24-ft. trailer and featuring a custom built glass garage door and custom build sliding glass door to provide plenty of light and ventilation. Tennessee Tiny Homes and Tiny Happy Homes are construction companies that build tiny homes on wheels that are classified as travel trailers (recreational vehicles). Joe and Kristen Everson are the owners and operators of Tennessee Tiny Homes and Tiny Happy Homes. Tennessee Tiny Homes was started in 2011 after Joe Everson’s nieces gave him a tour of their tiny playhouse in their backyard. Once he started researching tiny living, he caught the tiny house bug. SIzes range from 8-ft.x12-ft. to 8-ft.x30-ft., with prices from $25,000 to $52,000. Tiny House Chattanooga is owned by Mike Bedsole and is the progression from the company’s beginnings rooted in home remodeling. The remodeling & repair business yielded years of experience and success from projects big and small. “Building with out-of-the-box creativity is what inspires us to deliver mini masterpieces; converting dreams into livable reality,” says Bedsole. Models from Tiny House Chattanooga range from the 20-ft. Nixie to the 26-ft. Lookout. 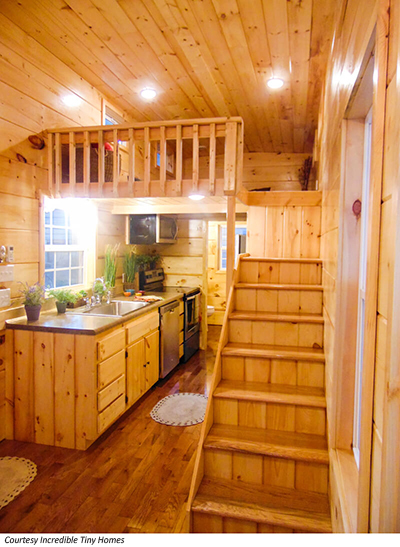 Finished tiny homes from Wind River Tiny Homes range in price from $25,000 to more than $100,000 and range from the 26-ft. Triton priced at $57,000 to the aesthetically-pleasing Monocle at 10-ft. x 24-ft. and priced at $76,500. Weaver, an owner of Wind River Tiny Homes, and his wife have lived in a tiny house for two years. The 276 sq. ft. gooseneck trailer-based tiny home called the Nomad’s Nest that was built by Wind River on an episode of Tiny House Nation“The tiny house has allowed us to live frugally enough to purchase property,” he says. The tiny house will become a rental once a new 900 square foot cottage is completed on the property to house the family that has recently expanded by a baby boy. You can buy a subscription by clicking on our subscribe link on our site.